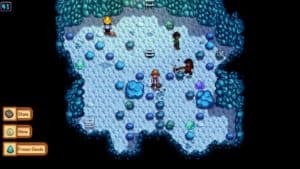 Stardew Valley Multiplayer Beta Goes Live on Steam | Nerd Much? In this difficult life as a farmer, it’s always nice to have a few extra sets of hands around. And with Stardew Valley having its multiplayer beta go live today, that time is now. The multiplayer mode allows for up to four players to work together on a new farm or within the farm of the party’s host. Each player will be assigned their own cabin and will work together to complete various tasks pertaining to fishing, farming, mining and fighting. Chucklefish says that the mode will feature scalable difficulty. So the better your team functions the more loot you’re likely to come away with each day. The developers are also implementing a chat box and 200 custom Stardew Valley emojis to ensure that communication between team mates is never an issue. Should you get along really well with one of your new farm hands, you can “craft a wedding ring to propose to a fellow Player.” Or, should you find your new neighbors to be a hindrance to your farming lifestyle, you can evict them by destroying their cabin and leave them homeless.